Perhaps it has to do with the arrival of the upcoming P20 series which is set to be launched on March 27 in Paris, we don't know. 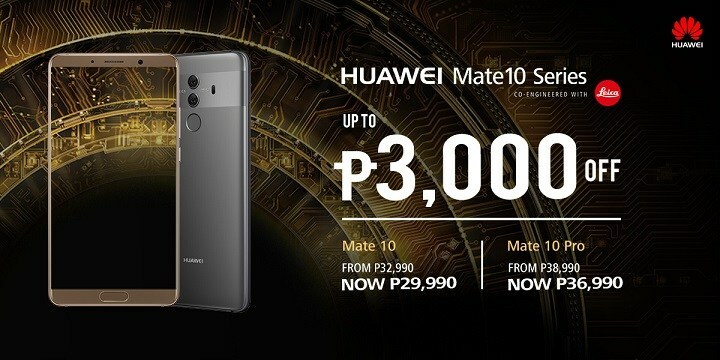 But whatever the real reason is, this update is definitely a good news for all Huawei fans in the Philippines especially those who are still eyeing to buy the latest AI powered Mate 10 and Mate 10 Pro as these flagship monsters just got a massive price cut - up to Php3,000. Starting today, you can now get the Mate 10 and Mate 10 Pro for only Php29,990 and Php36,990, respectively, at any Huawei Experience Stores, partner stores, and kiosks around the Philippines. You might be wondering if this is just time limited offer like they did with the Huawei Nova 2i last month where it was offered with Php1,000 off for the whole of February (though I heard it was extended until end of March 2018). Well, the Facebook announcement about this price cut on the Mate 10 devices, did not have any date alongside it, so I guess we can assume that this is now permanent price stickers of the two moving forward.